Dracena (Tri-Color) is a beautiful tropical filler green that can be used in any arrangement with other greens, with any kind of flowers, or simply by itself. 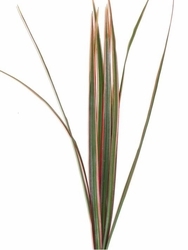 Dracena is a long, narrow bladed leaf with green, white, and red colors in it. Each stem is 12"-16" in length. *This item is sold as a bunch with 20 stems.